Let’s say you have already invested money in a good RC system (FrSky, Futaba, Spektrum …) or a Connex system and you want to use it to control your Ronin-MX and camera of choice. Well, I am sorry to tell you that you can’t do that but, …. wait for it, ... I am also happy to tell you that now you can. 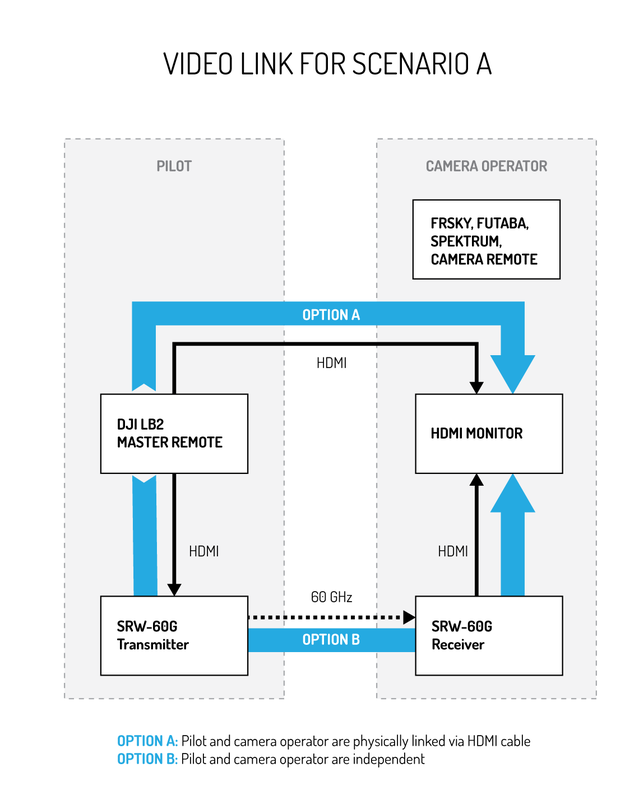 The problem: DJI Ronin-MX has exposed an S-Bus input, which means you can connect it to any existing RC system but, for Ronin-MX to have maximum performance (no acceleration drifts), it has to stay connected to the DJI A3 via CAN. This forces you to control the DJI Ronin-MX via the DJI LB2 which, in turn, disables the S-Bus input of the DJI Ronin-MX. 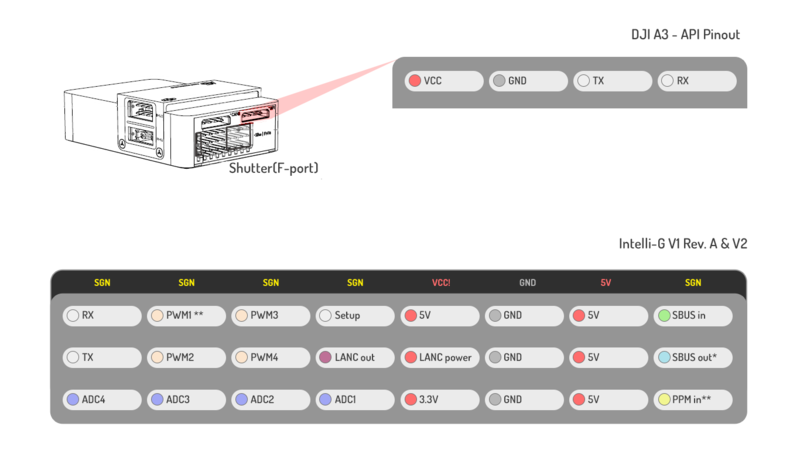 The solution: The new Intelli-G firmware, when combined with Intelli-G hardware revision A, enables you to map any of the input channels connected to Intelli-G (S-BUS, PPM, PWM, Analog) to the Tilt, Roll and Pan axes of the DJI Ronin-MX. 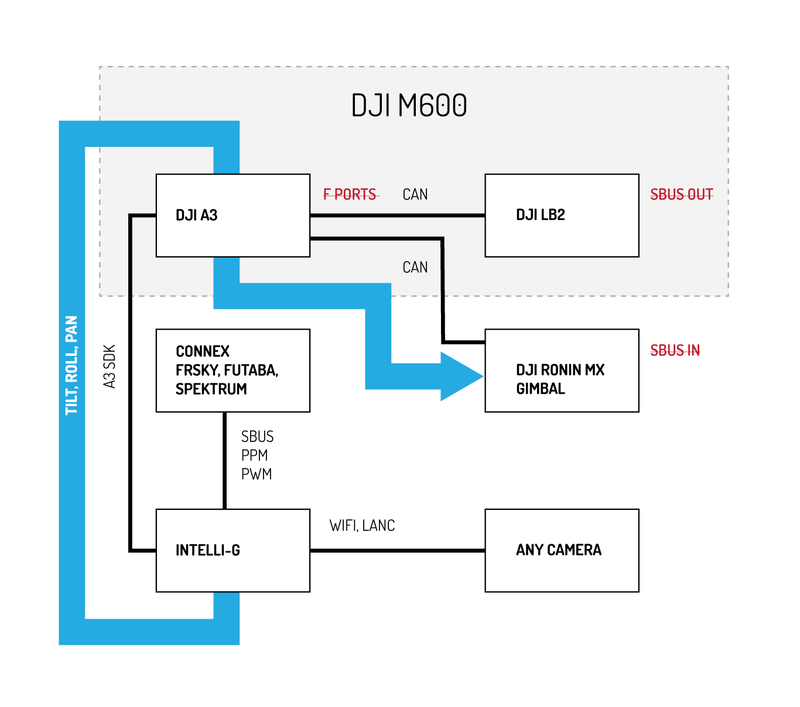 This means you can connect any receiver (including the Connex air unit) and the DJI A3 (through its DJI A3 SDK port) to Intelli-G and thus, control your DJI Ronin-MX. Interested? Please watch the setup video for Scenario A. You should be aware of the fact that most RC systems communicate over 2.4Ghz, which will most likely interfere with DJI LB2 and affect the working range of both systems. This does not apply to Amimon's Connex, which communicates over 5.8Ghz and can work very well in parallel with the DJI LB2. To solve the 2.4Ghz interference issues you can also use RC modules such as TBS Crossfire Transmitter and Receiver, which can be easily attached to most of existing RC systems. These modules are inexpensive and ensure a great deal of flexibility. Once you have such a solution you will no longer be affected by interferences. No Longer Supported - Due to the non-backward-compatible updates of DJI SDK for M600 and A3/N3 platforms, this scenario is no longer supported. Let’s say you have a Panasonic GH4 or a Sony A7x or any camera of your choice, and you want to control it with your brand new DJI LB2 system. This was impossible until it was recently made possible by Intelli-G. The problem: When the DJI LB2 Air Unit senses the DJI A3 flight controller, it stops outputting an S-Bus signal. On top of that, when DJI A3 senses the DJI LB2, it deactivates the F outputs (except for the retracts/fan ports). In other words, you have a bunch of F ports on your DJI A3 that are completely useless. This means there is no way you can take any RC signal out of DJI A3 or DJI LB2 and feed it to a camera RC solution, such as Intelli-G. The solution: We have developed a new app called Intelli-Go that will replace the DJI-Go app on your slave remote (the camera operator’s remote). 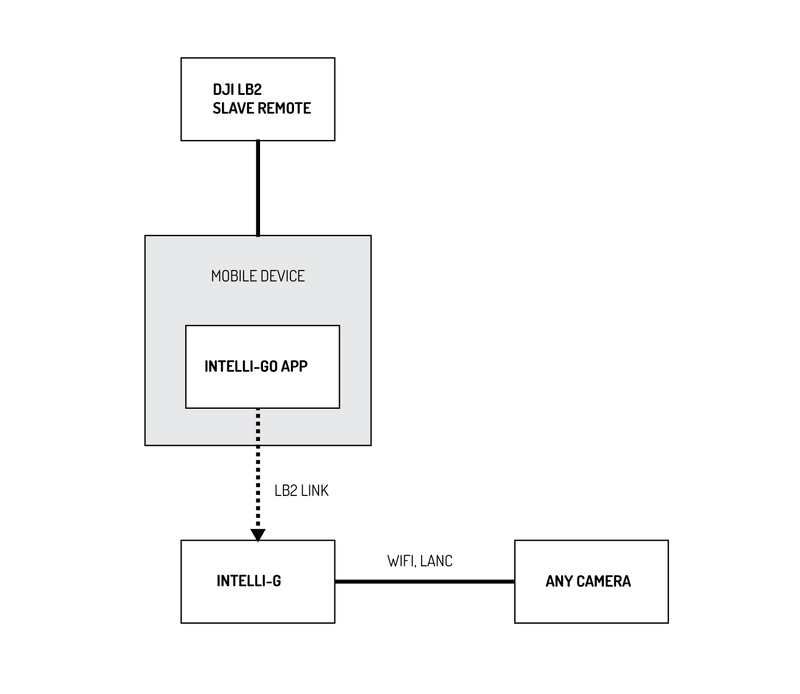 This new app talks to the Intelli-G device over the LB2 communication link and allows you to map the controls on your slave remote (buttons and dials) to your camera functions. Helpful? Please watch the setup video for Scenario B. The problem: Let’s say you have a non-DJI gimbal and you want to use your second DJI LB2 remote to control the gimbal like you do with DJI gimbals. If your FC is a DJI A3 combined with a LB2 then, as explained above, there are no RC outputs that you could connect to your third-party gimbal. The solution: We have implemented SBUS and PWM outputs which expose the LB2 Slave remote controls as if it were a standard RC system. For this to work, you must run the Intelli-Go app on the mobile device attached to your LB2 Slave remote (same as in Scenario B). You may use these outputs anyway you see fit as if they were coming from a standard RC receiver. This scenario is complementary to Scenario B which means you can control both the non-DJI Gimbal and the non-DJI Camera with the same solution. 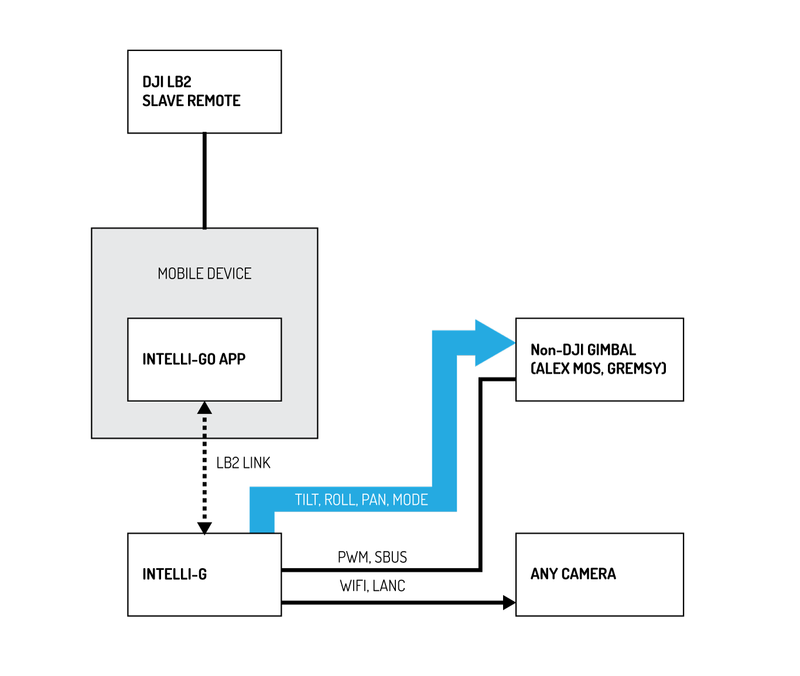 Until recently it was impossible to use a single DJI LB2 remote to control Intelli-G, since it implied running our specialized app (Intelli-GO) instead of DJI GO, in order to connect to the SDK of DJI A3 flight controller. Intelli-GO can only be run on the slave remote since DJI GO is needed to fly the aircraft. More details on this solution can be found in scenarios B and C (links). However, it is now possible to use a new approach by making use of the DJI Expansion kit. The DJI Expansion kit is the reason why DJI did not enable the F-Ports on A3 flight controller (as they had on their previous A2 flight controller). Check the discussion on this thread (https://forum.dji.com/thread-85188-1-1.html – search for word "port"). It shows that the F-ports are re-enabled in case you have such an expansion kit. This means that, by using the expansion kit on a standard DJI LB2 remote, you can map the extra channels to Intelli-G. This approach is also suitable in single operator scenario. This new setup does not interfere at all with the standard use of DJI remotes and thus, the slave remote can be used as envisioned by DJI (including for viewing purposes). For a more real-feel, you can check the Intelli-G Tutorial that emphasizes the use of Intelli-G in combination with the DJI Expansion Kit: https://youtu.be/_sS4io_kym0. This is a somewhat different usage of DJI M600 (or any DJI A3/N3 + LB2) platforms, and thus, detailed in a separate article (www.intelli-g.com/RTK).